Adium packaged for portable devices. Is there a better alternative to Portable Adium? Is Portable Adium really the best app in Chat category? 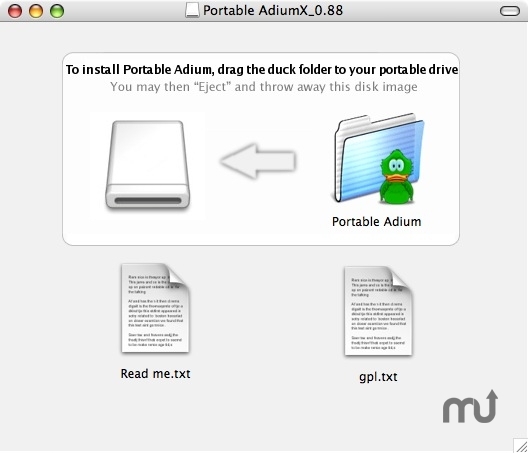 Will Portable Adium work good on macOS 10.13.4? Portable Adium is the multiprotocol Adium instant messaging client that can connect to AIM, MSN, Jabber, Yahoo, and more, packaged as portable application so you can carry around with you on any portable device, USB thumb drive, iPod, portable hard drive, memory card, other portable device (also on your internal hard disk) as long as it has 50 MB of free space and use on any Mac OS X computer, taking your conctact list, emoticons, message stiles, plugins, scripts, sound and users with you. Portable Adium needs a rating. Be the first to rate this app and get the discussion started! Drag "Portable Adium" folder to your portable device, USB thumb drive, iPod, portable hard drive, memory card, other portable device (also to your internal hard disk) as long as it has 50 MB of free space. You can copy your user preferences folder to Portable Adium when "Copy preferences" window asks you. So, if you wish to use your conctact list, dock icons, emoticons, message stiles, plugins, scripts, sound and users you already have on your computer, just click "Yes" when prompted.